I’d like to right away start off saying that although the speculative investments I have discussed so far are perhaps the most exciting (Shopify and now Tucows), they compose only a small portion of my portfolio. Oddly enough, Shopify is actually a customer of Tucows’ domain businesses. I don’t care much for that business though; as the CEO says in that article, it’s rather competitive and low-margin. What really appeals to me though is Ting. Now, if you’re like me, you’re probably wondering what net promoter score is. After a quick Google search, it’s the willingness of a company’s customers to recommend their brand to others. Wow, that’s impressive. Ahead of Amazon who gets my order on my doorstep within a day’s time? Or Southwest Airlines whose flight attendants rap on my flight? And MUCH further ahead of all other mobile phone providers? That’s a company I can get behind. In fact, 11% of their new customers join as a result of their referral program. Have you heard of any of those communities? Me neither. And I’m guessing the big telecom companies haven’t either. 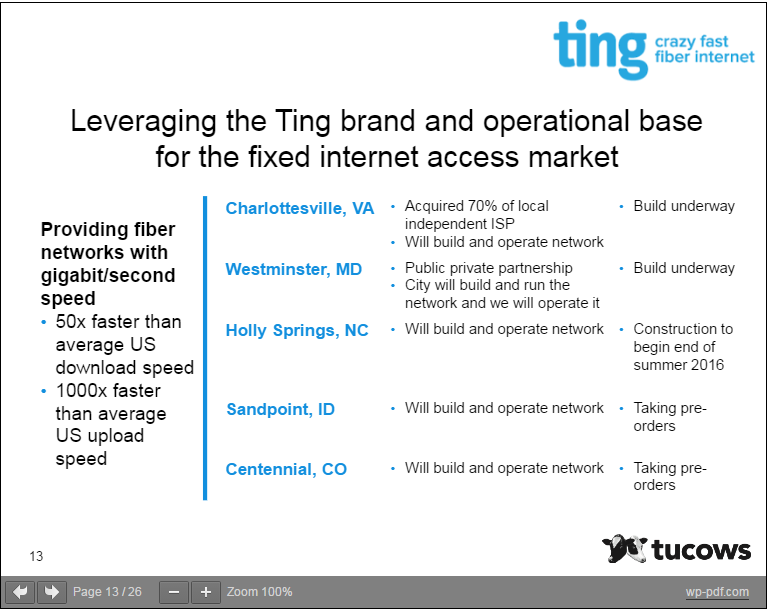 Ting internet is starting in communities where the big guys don’t make enough revenue to care, and that’s really, really smart. Generally fine with the company but it does not have a great record of beating earnings estimates. Yes you are correct, it now has an issue with valuation versus its quality and prospects. Sure growth has been good and will continue to grow but expensive @ ~ 33x PE. Investors love the eNom acquisition but it is a fairly big bet at $84 million. But the company is also buying back stock and insiders own 15%. Again, it doesn’t seem to have beaten estimates (sales growth was 9% last Q, but did decline from 11% the prior Q). Finding whether it has a real competitive advantage is hard to say. I’m typically not a big fan in investing in telecoms. I only have Telus and primary a bigger position on BCE and American Tower (AMT a long time now – I rather dominate the cell towers and never have to worry about it forever because it’s the infrastructures that counts. Cell towers are always needed and you don’t have to worry about client base loyalties and competiveness. BCE is the cream of the crops and I can sleep easy with it). 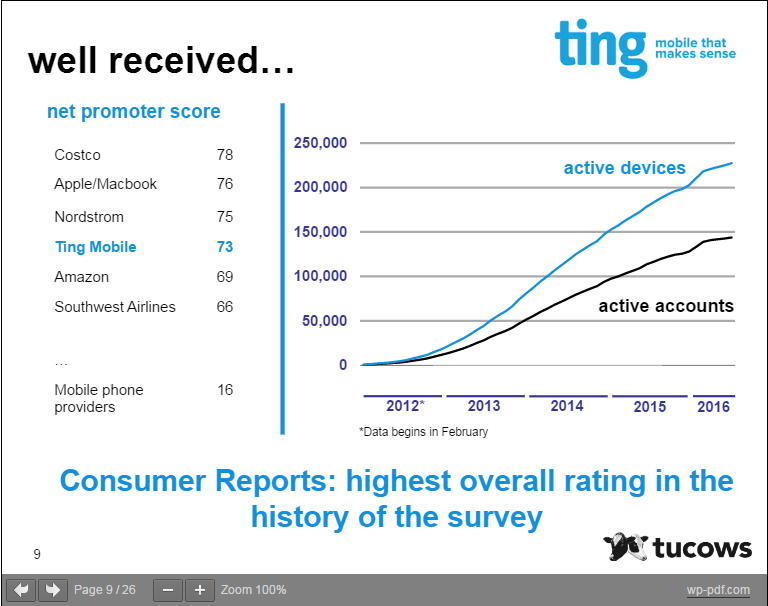 TC will most likely want to dominate more domain services rather than just mobile services. I wouldn’t be surprised if TC gets bought out years from now but for now it’s too pricey. He makes some good points, especially regarding the ownership of infrastructure. Although they don’t (and won’t) own any cell towers, they will own the fiber optic networks which I honestly think is more valuable as WiFi is slowly becoming our primary communication medium. I’m not invested in them yet, and I may not invest in them because I have recently found some potentially better alternatives (likely to be discussed in future emails), but I thought I should keep you guys informed on my research. In some ways they are riskier than Shopify (they aren’t the leader in their industry), but in other ways they’re less risky (consistent income). What remains to be seen is if they can maintain their quality customer service as they grow. Regardless, I’m willing to cheer on the underdog. July 2018 Update: After further research (and listening to a quarterly call), I discovered that Elliot Noss is in fact a Warren Buffett follower, automatically converting me into a huge fan. Revenue from Ting Internet should start generating in 2019. For more info, check out my Mid-August 2018 Update. Not sure Tucows has what it takes?